The Leongatha key position defender has been a rock for Gippsland over the past two seasons and has given himself every opportunity to be drafted after a brilliant National Championships which earned selection as one of only two Vic Country All Australians. He has been given the big jobs since early in his bottom-age year, as a lack of key position options at Gippsland in 2017 meant the 193cm prospect was thrown in the deep end without getting the opportunity to settle at the level. He came up against a rampant Sam Hayes at Healesville in the opening rounds and was on the end of a six goal first half from the now Port Adelaide tall, but didn’t let that performance get him down as he continued to develop his craft. He was given the chance to play in the forward half too and showed promising signs, which no doubt helped his development as a defender as well. In 2018, Reid has barely put a foot wrong which led to the defender being named the Power’s most improved player at its recent best and fairest. It is difficult to remember an outing in which he was beaten by his opponent for either Gippsland or Vic Country. He went about his business with minimal fuss and consistently got the job done for his team, becoming arguably the most trusted underage KPD in the country. Intercept marking has become a feature in his top age season, highlighted by a game against GWVR before the Championships in which a significant percentage of his nine marks came from opposition kicks and five were contested. 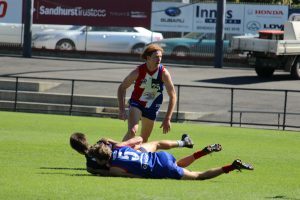 Reid finished the season in characteristically solid fashion, but a hamstring strain unfortunately saw him out of the Power’s Preliminary Final against Oakleigh. While there is no way he would have been able to reverse the 16-goal result singlehandedly, his direction and presence in the back half was clearly missed. Reid has all the smarts you want in a tall defender. Firstly, he gives himself the best chance by getting in the position he wants. Once there, he is difficult to move off his line and becomes a very high chance to influence the flight of the ball. He reads the incoming kick so quickly, which creates the required time to decide whether he wants to mark or kill the contest. He rarely gets that decision wrong either and even if he doesn’t take the mark, he ensures the risk in minimal when the ball hits the ground. It appears he predicts the play well, which gives him the opportunity to impact secondary contests or sit in the hole with influence if need be. Reid has always had the skill set, but his intercept marking has become particularly relevant this season. It is an attribute that has earned the attention of recruiters, especially considering the significance of turnovers in the modern game. He has a strong set of dukes and is willing to back himself with them aerially. While he doesn’t possess elite athletic traits, Reid is quicker than he looks and is capable of making up ground, but also ran a sub seven minute 2km time trial at the combine. His composure and consistency are also highly valued, creating genuine trust for his teammates and coaches. One of the most impressive things about Kyle Reid is that his weaknesses aren’t exactly obvious, which certainly sees him identified as a safe bet, but that doesn’t mean there isn’t room for improvement. He isn’t as confident when the ball hits the ground and there is a belief he is vulnerable one out in that situation, but what KPD isn’t uncomfortable in such a predicament? He can also play it pretty safe with ball in hand, despite being a competent and long kick. In saying that, there has certainly been a recent effort made to spread into space and create an offensive option when the ball is in transition toward the forward half. At 193cm, Reid certainly cannot be described as an overly tall key position defender, especially in a day and age where clubs are preferring key forwards and defenders be near or over 200cm mark. Thankfully for Reid, there are three excellent examples in McGovern, Rance and May who are all in the 193-195cm range and have adapted to be stars of the game in their defensive arcs. While it is unfair comparing him directly to such established players, there is plenty for him to take from these types and implement on-field at the next level. Kyle Reid is your lock down or intercepting key position defender who can be trusted to complete the required task on nearly every occasion. He is a safe selection who possesses attributes that suit the modern game, highlighted by aerial smarts that could even see him develop forward of centre. He is has become one of the premier junior defenders in the country, a justified All Australian and a player that has the tools to make it at the next level. Reid is unlikely to feature in the first couple of rounds of the draft, but will quickly be in consideration for those clubs looking to strengthen their defensive stocks.